The “Tufted Swiss Dot Simpress™” is an amazing silicone mold that perfectly creates a quilted texture with swiss dot embellishments for cake decorating. This amazing Simpress™ mold trims fondant, gumpaste and modeling chocolate into panels that can be easily applied to a crumb coated cake. 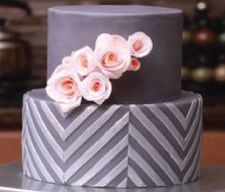 This informative video provides step by step instruction on how to use this innovative tool in order to create richly textured panels that are used to quickly achieve impressive results in cake decorating. Imagine pressing fondant into a mold that impresses a design that looks exactly like diamond tufted or quilted fabric accented with perfectly placed pearls. This instructional video provides all the tips and tricks to know when using the Tufted Swiss Dot Simpress™ in order to make decorated cakes that will impress your customers, friends and relatives. They’ll think you spent days decorating their cakes when in reality, using a Simpress™ enables anyone to create top tier cakes in minutes.